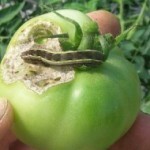 The tomato fruitworm is one of the most damaging insect pests to the tomato fruit. NC State University developed a series of documents that discuss a variety of common insects and related pests of tomatoes. They address the name, physical description, and biology of the pests, as well as recommendations for controlling populations and plant damage. This document from NC State University describes pests of the tomato plant and the types of damage each can inflict on the plants. The pests are categorized by the plant part that is attacked (leaf, fruit, stem, root). This comprehensive guide introduces plant-parasitic nematodes and discusses crop production problems, symptoms and control measures associated with nematodes. This resource was developed by the University of Florida and sometimes uses Florida-based data and examples. The lessons and concepts explored, however, can be applied to growers in North Carolina and the Southeast. Also, see the Control of Root-Knot Nematodes in the Home Vegetable Garden. A favorable greenhouse environment for growing tomatoes is also a favorable habitat for their insect pests. This document from NC State University identifies common insect problems in greenhouses and discusses pest management practices. 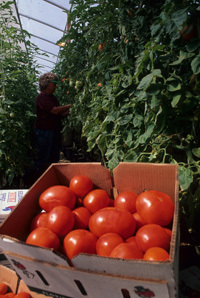 The objective of this University of Tennessee publication is to assist greenhouse tomato producers in implementing a pest management program, starting with the basics.